Very little can be confirmed about William Siddle, which was a common name in the Durham area. He joined the 18th (The Pals) Battalion Durham Light Infantry (DLI) at Cocken Hall. He landed in Egypt on 22 December 1915 and was transferred as a corporal to the Yorkshire and Lancashire Regiment. 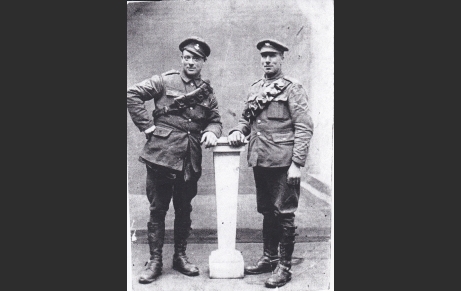 Subsequently he transferred back to the 18th Battalion and went to France where he rose to the rank of sergeant. He won the Distinguished Conduct Medal (DCM) during the ‘100 Days Offensive’ and was demobilised on 25 February 1919. “From 25th February to 16th September, 1918. He has throughout his service in France showed marked courage and initiative while in charge of transport proceeding to the line, and especially during hostile operations at Ayette in March 1918, where rations and stores were brought up under heavy shell fire. At Meteren, in May, 1918, when the transport was disorganised by heavy gas shelling, and was compelled to scatter, he collected his wagons, reorganised the convoy, and completed the delivery of rations. He has done consistent good work”.